Stretching from the historic Chesapeake Bay, along the coastline of the Atlantic; across the Gulf into the mysterious bayou swamps of Louisiana; to eastern Texas and up the Mississippi, wetland forests are a valuable, yet vulnerable national treasure. Up to 80% of wetland forests in the South have disappeared. Why Are Wetland Forests Important? How Much Are Wetland Forests Worth? Wetland forest ecosystem services are worth more than $500 billion. But wetland forests are under threat from logging and development. If we protected an additional 13 million acres of wetland forests and logged in a more ecologically friendly way, we could increase their ecosystem service value to almost $550 billion. The ecosystem service value of an intensively manage wetland forest is just $1,200 per acre. But wetland forests left alone are worth over $18,600 per acre. By shifting the focus of management from timber production to native ecosystem health, wetland forests increase in value over fifteen times. Each year, hurricanes ravage the U.S. South. By the time recovery efforts are complete for 2017’s hurricanes Harvey and Irma, each are expected to cost over $100 billion in damages. Luckily, scientists have found that wetland forests quickly absorb and slow more water than pavement or lawns during floods. Southern wetland forests are some of the most carbon rich ecosystems in the U.S.. Without this carbon storage, the impacts of climate change would be even more severe. Wetland forests also improve regional climate, because forests maintain a cooler temperature than non-forested landscapes. Fewer than 10% of wetland forests in the U.S. South are currently protected from logging, agriculture, and development. Wetland forests house many rare species, including the Louisiana black bear, hellbenders, and swallow-tailed kites. Some of the region was even designated a global biodiversity hotspot in 2016. In 2011, 25 million people in the U.S. South went out to observe nature and wildlife. Fifteen million people hunted or fished. These activities contributed $48 billion to the states’ economies. Wetland forests are an important ecosystem for hunters, fishers, boaters, and photographers to enjoy the outdoors. The forest products industry is sensitive to booms and busts of the global economy. In just five years (2004-2009), the South lost 20% of forest product industry jobs, mostly due to automation. As the industry continues to decline, states could redirect those skilled workers to restoration, management, and ecotourism jobs. 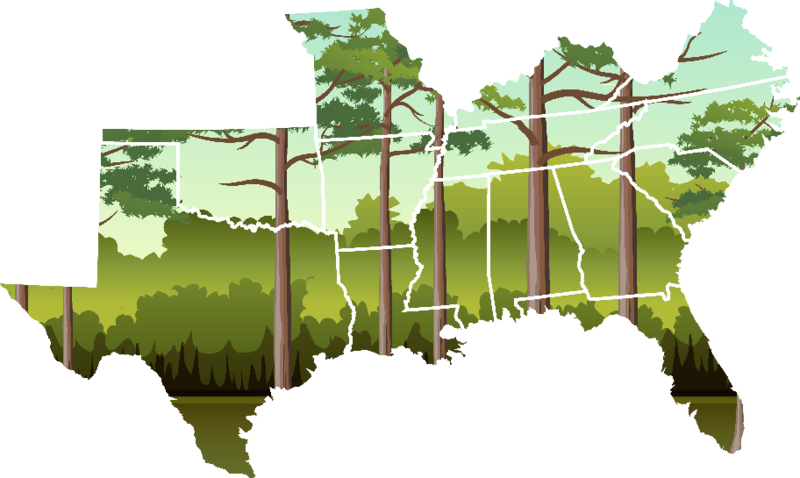 The U.S. South is among the most biodiverse areas on the planet. This immense biodiversity brings international visitors to our national parks. With dedicated conservation efforts, Southern wetland forests have the potential to draw more visitors and improve the economy. Standing forests are the only proven terrestrial system that can store vast amounts of carbon at the scale necessary to keep global temperature rise below 1.5 oC. Protecting wetland forests ensures that carbon remains safely stored in the forest while removing more from the atmosphere each year. Get involved today to help protect these valuable wetland forests.